As a boy, I lived a spell in East Texas. Somewhere on the edge of the urban sprawl, my sister and I ran barefooted down dirt roads, sat under the shade of mesquite groves, and tromped through fields of briars to the neighbor-lady’s house with all the aquariums. We were home on the range and my parents let us roam free, at least mostly free. There was a standing rule in the Haines family: don’t be caught out in an East Texas lightning storm. The rule was the direct outgrowth of some urban legend involving an old man from Sherman, Texas, I think. He’d been struck by lightning something close to a half-dozen times, so much, in fact, that he’d become some kind of human lightning rod. It was said that he described the moments before a lightning strike with electrifying detail: static charged hair stands on end, metal zippers begin to crackle, and the smell of ozone becomes so intense that it’s near euphoric. This story had never been independently verified — at six I was without scoop-worthy fact-checking sources. Nonetheless, my sister and I ran like wild animals at the first signs of storm. The piling up of clouds, the smell of splitting ions, the low rumble in the far-off country — those rumors sent us tearing for the house where our parents would be waiting on the back porch. Sometimes we’d all sit together and watch the storm build to a crescendo, the wall of rain advancing from the west, lightning tendrils touching nearby fields. As children, we were carefully trained to recognize the conditions for a coming storm. Sometimes I wish I had the same keen ability to recognize when conditions were just right for a good brainstorm. Bresson captures this thought in one of his most famous images. A man is caught in mid-leap over a rain puddle and, having made a gross miscalculation, will momentarily be the owner of one pair of soggy trousers. The decisive moment: the leap. The inevitable outcome: a trip to the laundry. 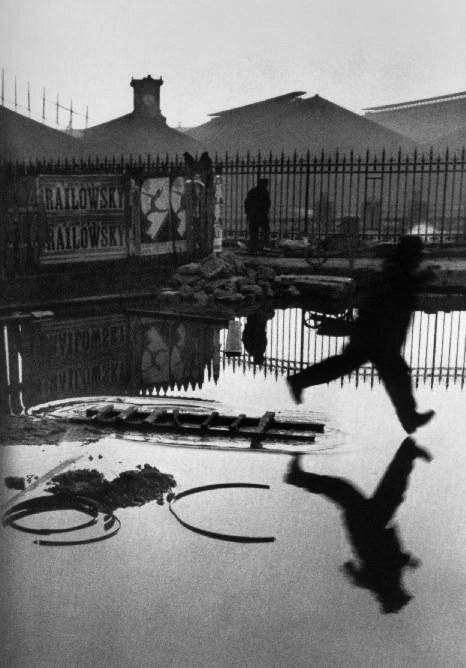 Bresson was a master at capturing the decisive moment. Perhaps that’s why his work is still revered today. Recognizing creatively decisive moments is more difficult than recognizing a coming thunderstorm. How often do I feel words rising, view a moving piece of art, see a stunning act of kindness at the farmer’s market, and fail to record its beauty (either with my pen or my mind’s eye)? How often do I miss the prompts that are happening all around me? It is the artist’s job to make the most of these personal decisive moments. And if we do, perhaps we can be the ones who capture lightning in a bottle. Would you like to join with us in capturing your own decisive moment this week? This month’s found poem theme at Tweetspeak is Rain, and we’re using book spines as the prompt. In fact, today’s post was inspired by the book spine of Annie Dillard’s An American Childhood (along with my love for Henri Cartier-Bresson’s photography). We’d love you to join with is. How do you participate? Last week we received some great rain themed book spine poetry. Photo (top) by fluffisch, Creative Commons via Flickr. Post by Seth Haines. That sky looks as though it has been torched. What color! Irresistible prompt. Thank you for mentioning my poem, Seth. It was a good one. I hope you work on something for this week! I love the imagery in this, Monica. I know exactly what you are describing and it is lovely. Was the picture above a bit of a prompt? Yes, the picture, and Maureen’s comment! Love the description at the beginning, wow, what a sense of place! Reminds me of a scene in a Scott Russell Sanders essay about staying on a porch during a strong storm with the same level of sensory details; another scene of his tells of lightning striking a tree while his daddy held a young SRS in his arms. Are you sure you’ve never been struck by lightning? Your writing (forgive me) electrifies. Thanks, Ann. As you know… puns are welcomed here! Now that you commented… maybe you could jump in? Maybe you could share what storms do up there in hoosier country (and is hoosier a proper noun?)? The Decisive Moment. Powerful to consider. I had to chuckle a the urban legends as I realize they many ways we parents sometimes borrow from them to keep our children safe and alert, as in the case of neighbors who told their little boys that there were bobcats in the woods behind their new apartment home. Poor boys had more than a little bit of fear about bobcats but they also never got lost in the woods. Kindle library? GREAT idea. And you must also be a rain summoner (see last week’s rain piece). Great spine… ahem… Kindle poem. I like how you conjur images of another world. A spiritual one, no? ahhhh – yes. 😉 thank you. Jumped over to you blog to blog to check out your poems. I REALLY like flood song. Great stuff. Keep ’em coming! I’m pretty sure you just upped the ante, my friend. Wow. LOL! Yes… I am smiling 🙂 bc I considered doing the same thing! Seth, this is so beautiful. Deeply artful. It fun to watch what’s coming out of this. This community is truly incredible!